Content Delivery Network (CDN) is used by web developers to serve the static content quickly. This way they can reduce the page load time and make their websites load faster. You can either use your own hosting server as CDN or purchase bandwidth from professional CDN service providers. There are hundreds of CDN service providers available on Internet but the popular names in this industry are Amazon S3, MaxCDN, RackSpace Cloud, Edgecast, Azure, Cloudflare etc. Amazon S3 is pay-as-you-use service and for MaxCDN the pricing starts from $40 for 1TB bandwidth. Similarly you can find the pricing for other services as well. 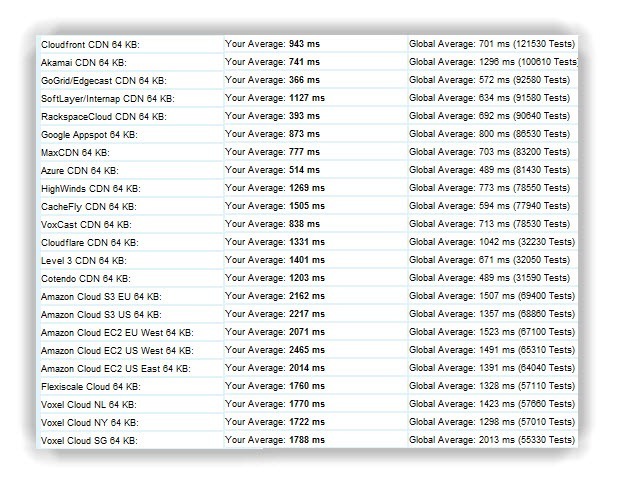 In above result, the global average load time is best for Azure CDN whereas my average time is best for GoGrid/Edgecast CDN. This test page used Google Chart tool to create such graph and uses smart-ip.net to get the geographical location of the user for testing purpose. WordPress users can utilize the CDN options available in WP Super Cache or WP Total Cache plugin and provide the final CDN link in the settings panel of these plugins. You can also create own CDN on the hosting account of your website or blog. If you own a busy website with traffic of around 500,000 views a month, then you should definitely consider using CDN for improved load time and user experience. As modern browsers are capable of service more than 5 HTTP requests at a time. You can serve the static contents like images, JS, CSS from the CDN and serve the text content from own hosting server database. This way you can reduce the load time and serve the content really fast. Post your feedback about the CDN usage and also let us know your favorite CDN service provider.